"Regain your freedom, with Eden..."
This product qualifies for VAT Relief. The price shown includes the 20% VAT Relief discount. Irregularities of blood circulation and nerve damage caused by diabetes means that keeping your feet healthy is extremely important. Irregularities of blood circulation and nerve damage caused by diabetes means that keeping your feet healthy is extremely important. KOMFORT SOCKS are designed to provide maximum comfort and protection for those with delicate and sensitive feet due to diabetes or arthritis. 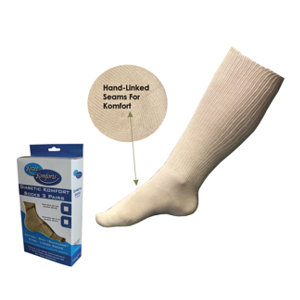 KOMFORT SOCKS seams are hand-linked giving a sympathetic and as non-irritating a seam as possible, reducing friction injury caused by more "traditional" seams. KOMFORT SOCKS extend to the knee with a gentle and generous stretch to provide mild support whilst allowing healthy air circulation. Product Features: - 75% cotton - 15% spandex - 10% amorphous polymers, with naturally occurring anti-bacterial properties. (Ladies Size 5 - 8) (Gents Size 9 - 12) (supplied in a pack of 3). They are available in a choice of Beige or Grey. Would you like to receive email marketing from us? * Occasionally we like to send news and special offers to our customers. Select yes if you would like to receive such marketing, or no if otherwise. Get the latest special offers, product information and news sent directly to your inbox. © 2019 Eden Mobility Ltd. All Rights Reserved.